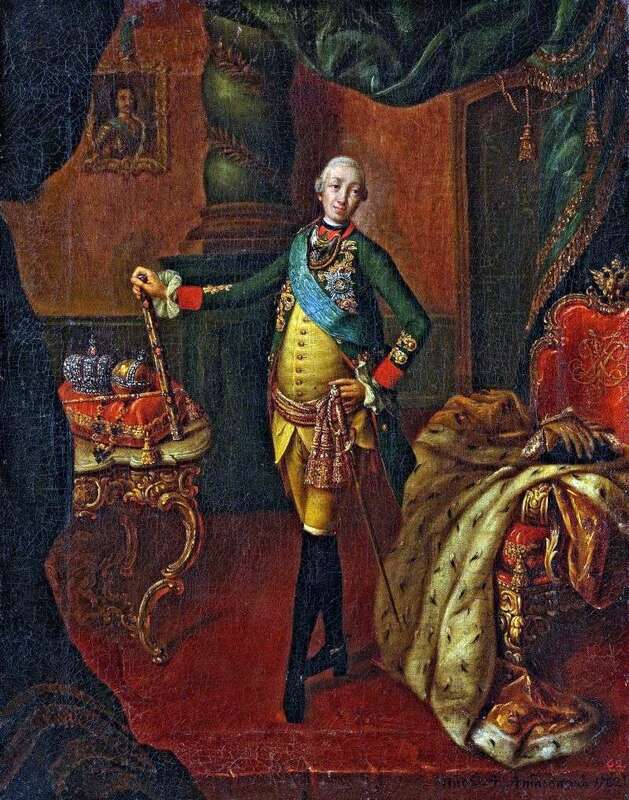 Looking at the portrait of Peter III, created by Alexei Petrovich Antropov, you pay attention to the contrast of the solemn atmosphere with the unattractive image of the emperor, the unlucky spouse of the great and magnificent Catherine II. In 1762, the Most Holy Synod decided to decorate its reception room with a portrait of Emperor Peter III, who had just ascended to the throne. The portrait was invited by Fyodor Rokotov, but his work did not please the sovereign. Then the portrait of Peter III draws the artist Alexei Antropov, who served in the Synod. The tsar approved the picture made by Antropov. He wanted to see himself as a great ruler and commander, and, as it seemed to him, he saw himself as such. The artist managed to convey the solemn ceremonial atmosphere of the hall, he showed all the royal attributes of greatness and at the same time preserved the true character of Peter III’s personality, not idealizing it. Indeed, in the picture we see all the royal regalia – the power and the scepter, the crown and mantle from the ermine on the armchair. The artist portrayed the emperor in a dynamic pose – his left foot was pushed forward, with one hand he leans on the marshal’s baton, the other on the belt. At the same time, the image of Peter III completely does not fit into the setting of the main hall. The emperor looks awkward, not at all manly – with narrow shoulders and a small tummy. However, Peter III liked the painting very much, he found it remarkable, but like himself. As soon as they did not ridicule the portrait of Peter III criticism – they said that the sovereign is like a grasshopper, that his stomach is big, his head is small, and his mouth is froggy. At the same time, it should be noted that the painters of the XVIII century did not create parodies for their customers, but sought for the accuracy of the image. It is not surprising that the portrait of Peter III, almost 2.5 meters high, was highly appreciated by his contemporaries. Moreover, soon a copy from this portrait was ordered for the Senate AP Antropov. It is she who is currently in the Tretyakov Gallery. Description and meaning of the painting Portrait of Emperor Peter III by Alexei Antropov.